On the southeastern coast of Florida, with its edges dipped in the Atlantic, sits the town of Jupiter, Florida. This sizable suburb of the Miami metropolitan area is a pleasant and popular place for native and famous residents alike, and the beauty of the beaches and inlets is bountiful. Jupiter is certainly an ideal place to live, but its paradisiacal location is not without its potential problems. Residents living on the water may experience seawall deterioration, while inland properties are susceptible to suffering from foundational problems and sinkhole formations. However, the homes and properties of Jupiter, Florida, can remain safe and secure with the help of the professional seawall repair, sinkhole remediation, and foundation repair services of Solid Foundations. The Jupiter Inlet, the Loxahatchee River, and the surrounding waterways afford a lovely locale for water front properties, but residences anchored against the water must rely on seawalls to keep their homes safe and dry. Seawalls usually do an excellent job keeping the water right where people want it, but over time, endless abuse from the wind and waves can incite the deterioration of seawalls. Jupiter seawall deterioration should be addressed as soon as the seawall starts to show signs of wear and tear because the costs will only rise like the tide when repairs are delayed. In order to get the seawall fix you need in Jupiter, Florida, contact Solid Foundations, which proudly provide Jupiter with seawall repair services. Our seawalls solutions involve our Targeted Grout Injection, our process for restoring your distressed or failing seawalls by injecting a polyurethane resin through small ports in the wall in order to plug leaks and penetrate underground voids. The specific resins we use in our Target Grout Injection process are hydrophobic grouts that cure under wet conditions without diluting and can therefore fill the voids with their high expansion rates and low viscosity. By being unaffected by the presence of water, our thin hydrophobic resins can create solid and impermeable masses that solidify the loose soils without the need for excavation. These resins meet Florida DOT specifications, so they are safe for Jupiter seawalls, and they also meet Solid Foundations’ high standards, so they are effective for Jupiter families. Overall, the state of Florida is renowned for sinkhole activity. Sinkholes are common in Florida due to the fact that the terrain of Florida consists largely of limestone, a porous rock that easily suffers erosion under the steady stream of acidic rain that constantly runs through the ground in our moisture-rich Florida climate. Different types of sinkholes form across Florida. Some occur slowly as the upper layers of the soil are worn away to reveal bedrock or sand on top of the bedrock steadily slips into bedrock openings and lowers the surface of the land. Others form more rapidly when water running through underground voids wears away the bottom layers of the limestone until only a thin surface layer is left. Pressure on that surface layer causes a collapse that takes down the remaining soil and everything on top of it. These types of sinkholes are the most dangerous because of how quickly they form and how little time they leave for people to respond to their presence. Therefore, the first sign of a sinkhole is the best time to call the sinkhole repair professionals of Solid Foundations. Signs of sinkholes include cracks in the concrete around your home; depressions in your yard; water collecting in small ponds around your home; slumping fences, trees, and foundations; cracks in the interior of your home; sloping floors; and sticking doors and windows. In Jupiter, Florida, and the rest of Palm Beach County, sinkholes are few, and when they occur, they are shallow, have a small diameter, and develop gradually. However, several sinkholes have been reported in Palm Beach County over the years, so Jupiter is still vulnerable to the occurrence of sinkholes. Therefore, Solid Foundations provides our expert Jupiter sinkhole remediation services in order to keep the homes and properties of Jupiter safe and level. We employ compaction grouting and void filling in order to stabilize the soils under and around your home, fill any openings that may be present, and seal the top layer of limestone to prevent future issues. Our effective techniques can stop Jupiter sinkhole formation as soon as its starts and keep your home on solid ground. Living in Florida means living above limestone and living with water, and the relationship between the excess of water in Florida and the limestone layers can cause problems for your Jupiter foundation. When large amounts of water run through the ground, they wear away the limestone and leave your foundation lacking support as it rests on voids resulting from erosion. They can also build up hydrostatic pressure on your foundation that pushes it to its breaking point. When no amount of water is present in the ground, the soils under your home shrink and shift in their dry state, and this activity can move your foundation along with it. Therefore, both an abundance and an absence of water can force your foundation to crack and settle and threaten the security of your family and property. Signs of these threats include cracks in your walls, floors, slabs, or columns, as well as sticking doors and windows; stairways pulling away; leaning chimneys; and even leaning homes. Thankfully, when you call Solid Foundations for your Jupiter foundation repair, our first-rate foundation repair services will restore your foundation and renew your peace of mind. Solid Foundations uses only the most effective methods and most quality products to complete foundation repair services in Jupiter, Florida. Our foundation repair and underpinning methods involve durable products such as steel push piers, helical piers, slab piers, resistance piers, well anchors, cement grouting, and polyurethane resins, and all of our Grip-Tite® pier systems come with a lifetime transferrable warranty. Our skills with these tools, combined with our economical pricing, guarantee the most valuable foundation fix possible in Jupiter, Florida. 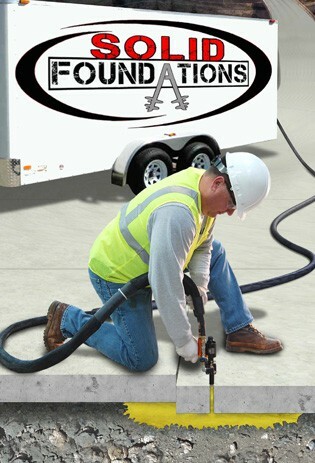 At Solid Foundations, our mission is to solve the problems of the communities of Jupiter, Florida, and we do so by not only supplying seawall repair, sinkhole remediation, and foundation repair services, but also by offering pipe and structure leak repair, French drain installations, soil stabilization services, and more. We are here to get the homes and buildings of Jupiter back on solid ground, so call Solid Foundations today for all of your Jupiter foundation repair needs! Call us at 1-855-227-0300 or fill out the form below for a free estimate. We look forward to speaking with you regarding your project. Web Site Designed In 1992 | © 2019 Solid Foundations All Rights Reserved.